Old Church Creamery is a family operation. Catherine Long works alongside her husband, Keith and two children, Matthew (17) and Anna (13.) Daughter Karen Madison is the family cheesemaker. Karen’s son Daniel and husband Glen help with yogurt processing and deliveries. The Long family gave up their high rise apartment in 2008 and started the farm as an educational and entrepreneurial experience for the whole family. Once you try their products, you understand why they’ve become such a hit, and a conversation with any one of the family members or employees seals the deal. These are nice people with delicious dairy products – what’s not to love? 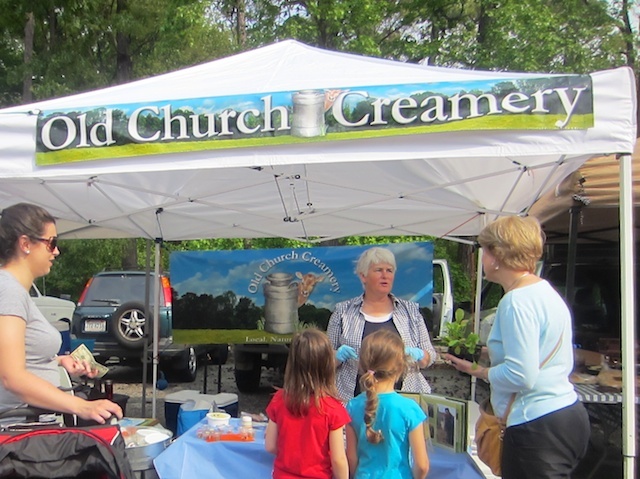 In addition to the South of the James market, you can find Old Church Creamery at The Byrd House Market, The West End Market, St Stephens and New Highland Baptist Church. You can also find their products online on Fall Line Farms and Local Roots and in stores including Libbie Market, Little House Green Grocery, Urban Farmhouse Market Cafe, Farm to Family as well as at their very own farm store. 1. What is the name of your business, and what do you sell? We are the Old Church Creamery, a family-run dairy cow farm. My husband and I raise Jersey cows and we sell seven varieties of savory cheddar cheese, three chocolate dessert cheeses, yogurt, Greek yogurt, fruit flavored yogurt, the probiotic known as kefir, and creamline, Grade A pasteurized milk in four bottle sizes. 2. What’s your most popular item, and why do you think it’s such a hit? Our most popular item is the Greek yogurt, which is sold in cup and quart sizes. We think it is so popular because of its light, delicate texture, and its creamy taste. It is very versatile, with customers eating it plain, or in dishes such as fruit/granola parfaits, flavorful zesty dips for vegetables or chips, or in main dishes such as tacos, stroganoff, or lasagna. 3. How long have you been in business? What is something that would surprise people about what you do? We have been farming since 2008 and have been making a variety of dairy products which we sell directly to consumers for over one year. Prior to this time, we lived in a high-rise apartment in Vienna, Austria and Brussels, Belgium. 4. What other market vendors do you trade with or buy from? We buy jam wholesale from Agriberry and Empress Farm. We also buy all our granola from Thinking of You Creations. We get up around 4:30 am and start packing all our vehicles to attend the farmers market. We also need to feed all the baby Jersey calves their milk and help out with other chores while my husband milks the cows. Then we are off to buy ice and a cup of coffee. When we arrive at the market, we start setting up our tent, putting up the banners and getting all the items ready for sale. We started with the South of the James Farmers Market in April 2013 and already we have many regular customers who come to pick up their kefir, yogurt or Greek yogurt. They like to see the photos of the cows and our kids and talk about how they use the Creamery products in various recipes. *That’s a whole lotta dairy. Please consume responsibly. 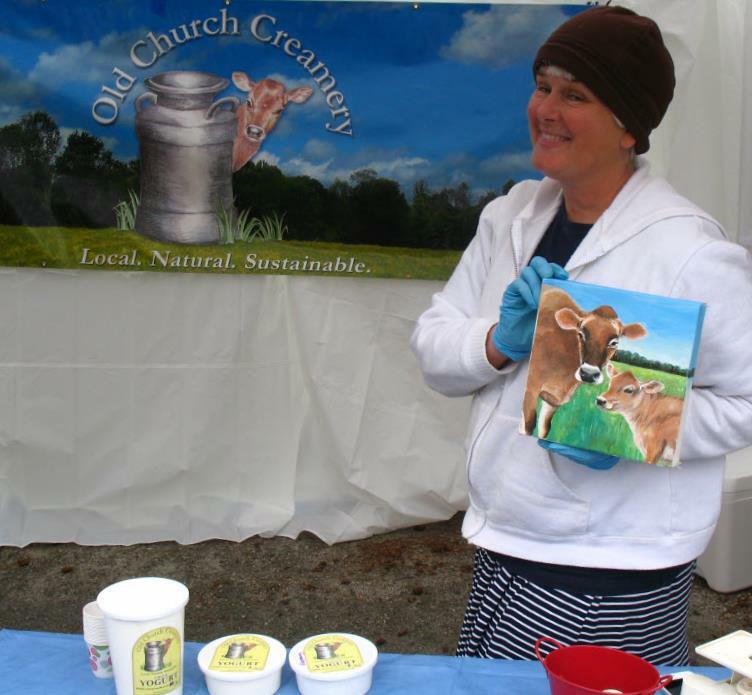 Want to learn more about Old Church Creamery’s business practices? Catherine wrote a post for the Fall Line Farms blog about just that!